Two smaller shops as well and an attached garage. 13 acres with an awesome stream running through the yard with frogs and crayfish. Alot of wooded area for my son and daughter to have adventures and a lake right accross the street. There is a 1/4 mile driveway so our entire church could come out for get together's and baptisms. It will be expensive in heavy snowfalls to keep the drive clear. (the monster snowstorm last week cost $250) but the riding lawnmower with a snowblower attachment will work fine for most snowstorms. Best of luck with your new venture. 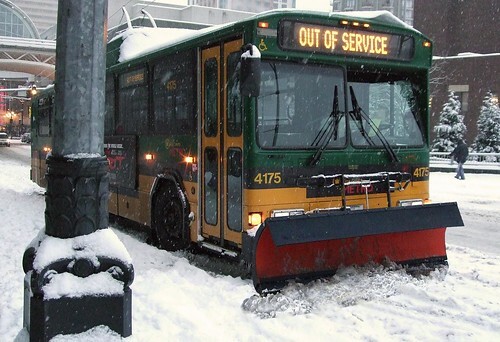 Sounds great, but for the heavier snows, instead of the rider mower, you might need your bus with a blade out front. Nice to hear Rick, best of luck, A bus and his nut deserve the best! good luck. Congrats on the new digs. Sounds like every busnut's dream. Now let's see a 30x50 heated shop, 200amp electrical service, parking for at least 6 busses...sounds like the making for another rally. All that is left is to decide on the dates. Sounds like a dream come true! I hope you get it. jeremy, isn't that pronounced "pluff"? Jeremy (now hiding under my desk). I just happen to know a guy who has a decent used backhoe for sale that would handle both those problems! (the monster snowstorm last week cost $250) but the riding lawnmower with a snowblower attachment will work fine for most snowstorms. Keep an eye out for a good used tractor with a bucket and a box blade, that would solve a lot of your problems. Mine works great, and you can often find a good buy on them used. Rick an old Ford 8 or 9-N are under 1800.00 with a blade and scraper. Man, you own a bus, a big @$# bus, and you are going to screw around with a little 8-N, don't be ridiculous. I have used both for years. They are cheap to run and can move a lot of stuff including use the forklift attachment. front end crane, scraper and bucket. Around the farm they are great. Around the job site a D8 or 10 is nice to have. And OBTW they can pull a bus out of the mud. But that thing would be fun to play with. Caltrans may have an old one we can have eh!! !